Over a month ago, Indian troops crossed into China at the Sikkim section of the border between the two countries, instigating a standoff with Chinese troops. This is arguably the biggest crisis facing the two countries since the 1962 border war, since there is still no sign of the Indian troops ending their trespass into Chinese territory. The Sikkim section of the China-India boundary was delimited in 1890 with the Convention Between Great Britain and China Relating to Sikkim and Tibet, and the boundary demarcation is recognized by both China and India. However, India claims that a road being legitimately constructed by Chinese troops in Chinese territory has "serious" security implications for India. It fears it will lead to the cutting of the so-called chicken's neck — the corridor, 20 kilometers wide, that links the Indian mainland to its northeastern states. As a result, New Delhi decided to make a"preemptive" move. Knowing the Chinese border troops will refrain from "firing the first bullet", Indian soldiers have time and again employed such shady tricks in disputed areas. But this time, New Delhi has sent troops into China's Donglang area, which is not disputed, and which is nowhere near the trilateral junction that separates China, India and Bhutan. India has harbored the belief that Beijing would compromise due to the upcoming ninth BRICS Summit in Xiamen, Fujian province. And because of this misperception, New Delhi has been emboldened to "dig in". India's border provocation constitutes a diplomatic and military challenge to China, carries strategic implications for it. With its troops trespassing in Chinese territory, New Delhi has taken a dangerous step by inciting confrontation. So far, China has exercised restraint, but its patience will not last forever. China has repeatedly stated that it will defend its core interests, which include its territorial integrity. China does not have any strategic ambition to manipulate South Asian or Indochinese Peninsula affairs, but that does not mean it will allow its own territory to be encroached upon. It seeks to handle border issues in line with international laws and documented evidence, but it does not fear a clash on its borders with a neighbor, if that is what is necessary to defend its territory. It has abundant resources to keep the risks controllable should a showdown occur. The 1962 border war between China and India is history. China can now force illegal intruders back across the border more easily than it could 55 years ago. While continuing to be engaged in diplomatic efforts to persuade India to withdraw its troops from Chinese territory, China should be prepared for military action should that prove to be its only recourse. As China has repeatedly emphasized, although the diplomatic channels are unimpeded, the withdrawal of the Indian border troops who have illegally crossed into China's territory is the prerequisite for any meaningful dialogue between the two sides. Although the crisis is fundamentally an outcome of India's perception of its geopolitical role and worries about the rise of China, playing up the idea of an all-out geopolitical clash between the two countries is uncalled for. After all, China and India are close neighbors and a healthy bilateral relationship meets the need of both for a favorable environment for development. The two countries should seek to reconcile their border issues and jointly strive to maintain regional stability. The author is a senior researcher at the Pangoal Institution, a think tank. 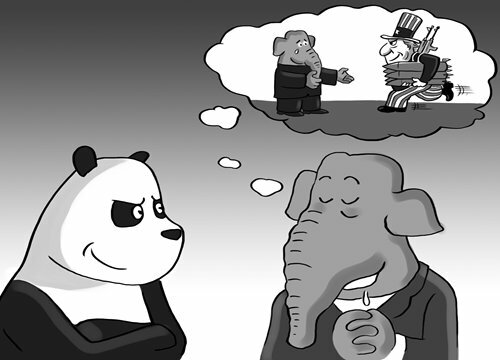 Should China adopt a more aggressive foreign policy towards external threats?